Bridge Baron Game - Download and Play Free Version! 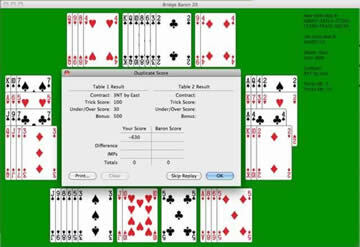 Take Your Contract Bridge-Playing Skills to the Online Arena! Contract bridge is a well-loved card game that’s noted for its complexity and depth, especially when compared to other games in the trick-taking family. Unfortunately, not only does it require four players, but teaching a beginner can be a tricky process. 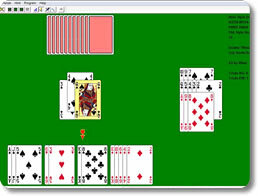 Fortunately, Bridge Baron offers an unprecedented level of configuration not seen in any other electronic bridge game. Before you get started playing a round of contract bridge, Bridge Baron allows you to pick and choose what rules and variations you would like to play under. Choose from over half a dozen bidding systems, including Standard American, Standard English, Precision, Forum D, Goren and Two-over-one. Determine the speed and skill level of your computer opponents. Set what you consider to be weak bids. Pick and choose your game conventions. Play your games using any combination of Jacoby Transfers, Unusual No Trumps and/or Negative Doubles, or don’t use any at all! Contract bridge is a game of skill. The saying that “practice makes perfect” certainly applies to it, but taking a close examination of your in-game actions can also prove useful. Bridge Baron provides several means of doing exactly that! Review the order of cards played at the end of every round. Watch replay videos of your games, complete with inside looks at your opponents’ actions. Automatically records the cumulative statistics of every game you have played. Take a gander at them to see how far you’ve come! Perhaps the best thing about Bridge Baron is that you don’t need to play against the computer; you can just as easily go online to play with and against other people! 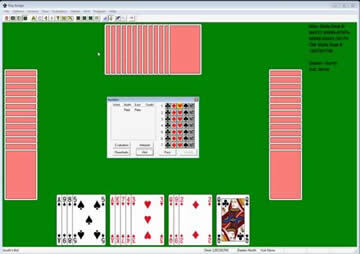 Go head-to-head with three other players, partner up with one and compete against the other two, just like in conventional bridge. Hop on to play a quick game, or set up your own to configure your preferred rules and settings. There’s Just No Beating It! If you’re an avid bridge player, then you should not miss out on Bridge Baron. With endless customization, multiple levels of difficulty, intelligent computer players, and multiplayer components, it has everything you need to enjoy the game anytime and anywhere. Without a doubt, this is the definitive electronic edition of contract bridge!